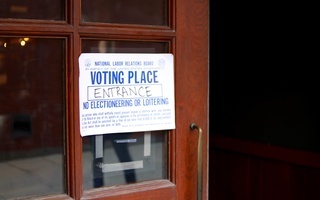 A sign pointing to a polling place during Harvard's second unionization election last month. Labor experts and union organizers say Harvard’s recent move to bargain with its graduate student union may boost efforts by student assistant unions at peer universities to bring their administrators to the negotiating table. Despite a 2016 National Labor Relations Board ruling establishing teaching and research assistants as unionizable employees, graduate student unionization efforts at several private universities around the country remain stalled. On these campuses, university administrators have either declined to bargain with elected unions or objected to both proposed and actual student union elections. Harvard’s move on Tuesday to bargain with Harvard Graduate Students Union-United Automobile Workers marks a departure from that trend. Only one other private university—New York University—has voluntarily recognized a union of student assistants. 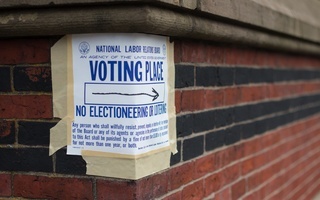 Labor experts widely expect that the current Republican-led NLRB will reverse the 2016 precedent that allows student assistants to unionize if it hears a viable case on the matter. 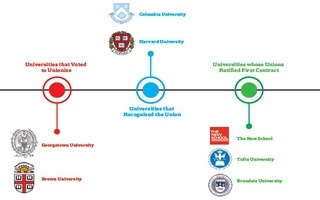 Several universities opposed to student unionization—including Columbia, Yale, and the University of Chicago—appear to be acting on this assumption, bringing challenges to the precedent before the Board and federal courts. Students and union organizers have responded with protests. 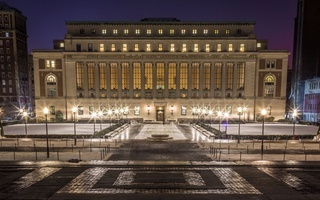 The graduate student union at Columbia—which students voted to approve in Dec. 2016—concluded a week-long strike on Monday in an unsuccessful attempt to push administrators to recognize the union. At the strike’s conclusion, Columbia organizers expressed their intention to strike again next year. Members of Boston College’s graduate student union have similarly organized public demonstrations in recent weeks protesting the university’s refusal to bargain with the union. 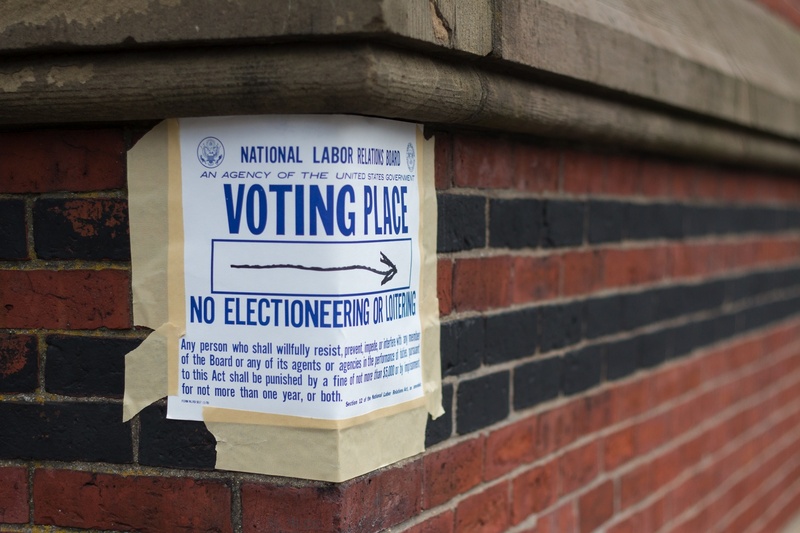 At the University of Chicago, where graduate students voted to unionize in Oct. 2017, university administrators objected to election results before the National Labor Relations Board, asking the agency to override its previous opinions on the right of graduate students to unionize. In an effort to preclude the NLRB from hearing a case on graduate student unionization, the parent organizations of several graduate student unions—including the union at UChicago—withdrew their representation petitions in early 2018, putting a hold on further legal action. Olga Brudastova, a Columbia organizer, wrote in an email that the Harvard decision adds “momentum” to the unionization movement. UChicago organizer Katie Nolan said she thinks Harvard’s decision to bargain undermines arguments made by universities who have declined to negotiate with graduate students. 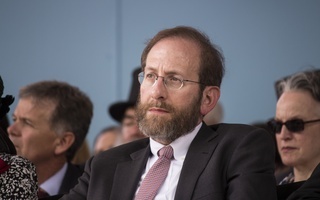 University of Oregon professor Gordon Lafer wrote in an email that Harvard’s move to bargain may encourage other universities to follow suit. Former NLRB Chairman William B. Gould IV said that, while other universities may not follow Harvard’s lead, the decision to bargain could serve as a model for future discussions on graduate student unionization. “I think that the major impact of this is going to be to provide an example of how collective bargaining possibly can work effectively,” Gould said.